It’s difficult and not fun to be the president of the United States—they shouldn’t work constantly, and realistically are better at being the president if they take periodic breaks. All presidents have their escapes, whether it’s Nixon’s affection for Key Biscayne or the Reagans’ retreat to Rancho Del Cielo. 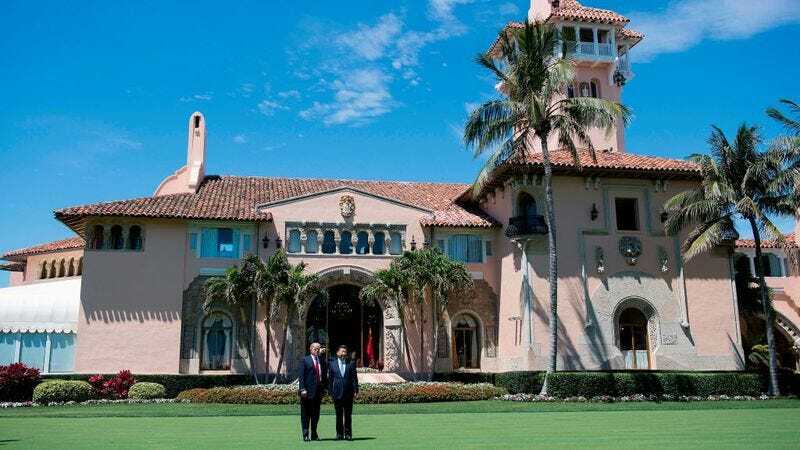 Our current president’s choice of respite is his tacky West Palm Beach resort Mar-A-Lago, a golf club where, for the scant price of $200,000, members can watch as the president conducts foreign policy live in the dining room. Play your cards right and you may even get a selfie with the guy who carries the nuclear football! Thus, it is helpful that concerned citizens have constructed a website called Is Trump At Mar-A-Lago?, which helpfully lets visitors know using clear bold letters if the president is currently enjoying the “winter White House” or deigning to spend time at, you know, the actual White House. (It’s actually the work of the Center for American Progress Action Fund.) Perhaps most helpful is the site’s running tally of taxpayer money that has been spent on these getaways—currently notched at $25 million—a sum for which a dropdown widget then lets you estimate the possible alternate application. Instead of hanging around in front of paintings of himself, for example, Trump could’ve allocated that money to feed 9,000 Meals On Wheels recipients or educated 2,000 more students. He could’ve donated his salary 322 times over to the National Park Service rather than spend seven of his 13 weekends as president thus far hanging out at his own goddamn golf club. But no, being president is a tough job, and it’s important that he remains rested so he can better and more impulsively drop bombs on countries whose names he may or may not even be able to remember.